The artist Brion Gysin is accredited with developing the ‘cut-up’ montage technique – a new form of writing whereby text and image fragments are intuitively pieced together to form open associative narrative structures. This method of ‘cut-ups’ has since been utilised as a method of writing, from the earliest automatist techniques influences of Dadaism and surrealism, through to Tristan Tzara pulling pieces of poetry from a hat. One of the most interesting examples of this approach can be heard on The Cold Spring Tape (a legendary cassette-only release of 100 copies)featuring readings and interviews with Genesis P. Orridge of (at that time) Psychic TV, William S Burroughs and Brion Gysin, where they explain their procedural rules of ‘cut-ups’. This ‘rule-based’ method of creating has been likened to a disruptive technique arising from a distrust of order and rules within language, thus making it ironically most suited to the development of a new vision for the city that is in part a critique of traditional urbanism.The legacy of this cut-up town planning method is evident from the post-modern writings on ‘Learning from Las Vegas’through to the work of Rem Koolhaas’ and his treatment of the ‘city as an object’. So in transferring this creative methodology and critical theory to architecture and urban planning we inevitably have something that is either paying some unspoken homage to this disruptive and creative ‘cut-up’ process, or part visual and intellectual plagiarism of architectural forms. And this appears to be the origins of the Tyne Deckas a montage of both architectural forms and of ideas. As a form, it clearly borrows from Le Corbusier’s rejected 1932 competition entry for the design of the Palace of the Soviets. As an idea it also has a lot in common with this historical modernist future proposed for a then young communist nation in need of an administrative centre, just like the newly formed Tyne and Wear County Council. Corbusier's 1932 competition entry for the Palace of the Soviets. I first saw this design in Rowe and Koetter’s Collage City, an important academic critique of modernist architecture and city planning, where they presumably used Le Corbusier’s project as a poor example of how architecture presented as utopian ideas, was often little more that egotism. As an alternative, Rowe and Koetter promoted architectural pragmatism in the choice of working methods and theoretical grounding; as intellectual pragmatism is an inevitable part of the design and construction of the modern city where multiple agents gets their hands into the messy decision-making ‘creative hat’ that is full of competing theories, concepts and process.It was about following a process or a set of alternative rules, and it was a rejection of more traditional (a.k.a. capitalist) methods. 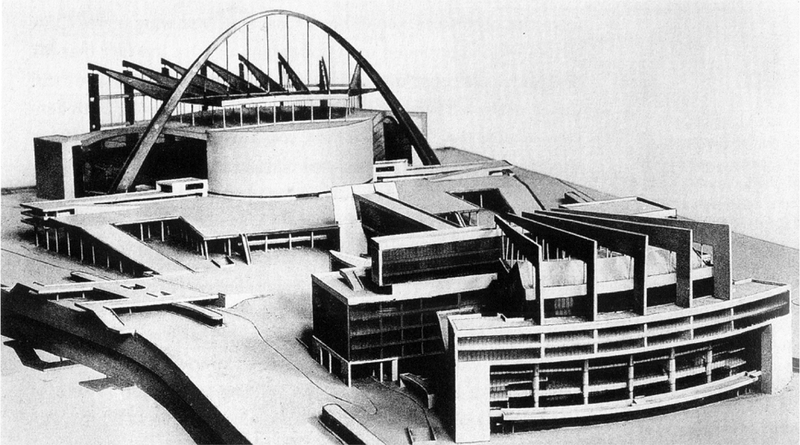 Corbusier's proposal for the Palace of the Soviets next to the Tyne Deck - Spot the difference. Yet the timing of the Tyne Deck proposals, from 1969, significantly predates the publication of Collage Cityand is contemporaneous with (and so I assume inspired by) the early ‘cut-up’ creative lyric collaborations between William Burroughs, David Bowieand the magnatic tape-splicing undertaken by Cabaret Voltaire. “… The inspiration of Dada offered a guidebook of how to go about deconstructing a world that did not adequately represent the one we actually inhabited … like others, we filtered, collated, and cut up visuals in true Gysin style … (t)he sights and sounds were strange pre-echoes of the Burroughs-esque dystopian world we inhabited”. Now tell me that that ‘cut-up’ description doesn’t fit the Tyne Deck as it sits as part of our collective “ransacked heritage”. As an ironic postscript, the building of the eventual neo-classical winning entry for the Palace of the Sovietswas aborted by the war and later had its’ foundations converted into the world’s largest open-air swimming pool. The Tyne Deckalso remains unrealized and similarly full of water. Robinson, E.S. (2011) Shift Linguals: Cut-Up Narratives from William S. Burroughs to the Present (Rodopi, Amsterdam). Lydenberg, R. (1978) “Cut-Up: Negative Poetics in William Burroughs and Roland Barthes”. Comparative Literature Studies15(4) 414-430. Venturi, R., Scott Brown, D., Izenour, S. (1972) Learning from Las Vegas(MIT Press, Cambridge MA). Dağlioğlu, E.K. (2016) “Karl Popper’s architectural; legacy: An intertextual reading of collage city”. 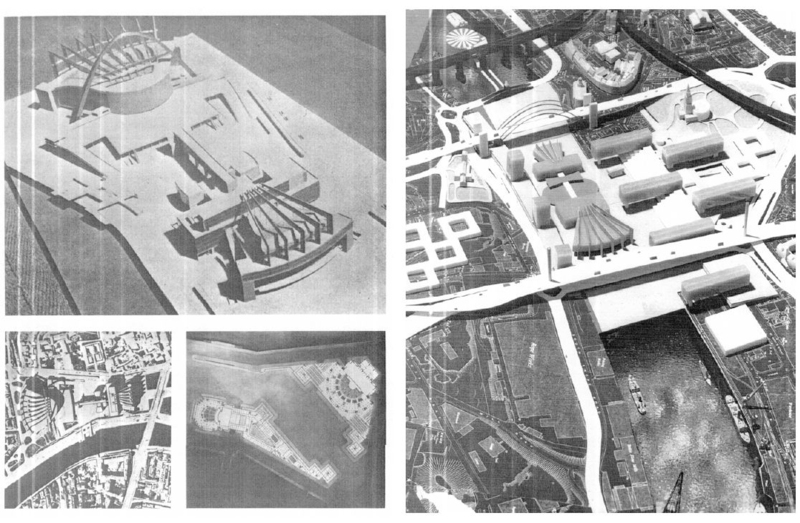 Metu Journal of the Faculty of Architecture33(1) 107-119.
p70 in; Rowe, C., Koetter, F. (1978) Collage City(MIT Press, Cambridge MA). This was most clearly described by; Debord, G. (1967) The Society of the Spectacle(Black and Red, Petersberg Florida). Wien, K,. Fallows, C., Genzmer, S (Eds.) (2012) Cut-Ups, Cut-Ins, Cut-Outs: The Art of William S. Burroughs(Verlag fur moderne Kunst Nurnberg, Nürnberg). Named after the restaurant that was supposedly the birthplace of Dadaism; Sandqvist, T. (2006) Dada East: the Romanians of Cabaret Voltaire(MIT Press, Cambridge MA). Quotation by Stephen Mallinder, one of the founding members of Cabaret Voltaire, takenfrom the forward and introduction to; Reed, S.A. (2013) Assimilate: A Critical History of Industrial Music(Oxford University Press, Oxford). Fish, M. (2002) Industrial Evolution: Through the Eighties with Cabaret Voltaire(SAF Publishing, London).